When Dr. Jennifer Conrad needed to have an MRI performed on one of her patients, she knew just who to call. She picked up her phone and dialed the number for AVMI. While there are hundreds of diagnostic imaging facilities in southern California, there are only a handful of diagnostic imaging facilities in the greater southern California area that perform MRI procedures on veterinary patients. Indeed, even for the typical veterinary patient, Dr. Conrad’s patient, Shirkon, presented some unique challenges. 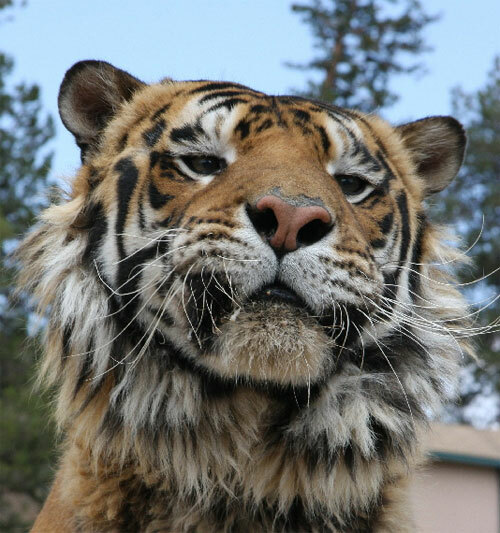 You see, Shirkon is a 16 year old, 425 pound, male Siberian Tiger. Shirkon is not just any Siberian Tiger either. Working with his trainer, Randy Miller, the first ever World Stunt Academy Award winner, Shirkon has entertained many of us over the years by performing in numerous movies, TV shows and documentaries (see sidebar). In the weeks preceding Dr. Conrad’s evaluation of Shirkon, Randy had noticed that Shirkon was developing a gradual progressive weakness and loss of coordination. Shirkon was so weak he was having a hard time with even normal activities like eating. Dr. Conrad performed routine laboratory tests which failed to reveal a metabolic reason for Shirkon’s weakness. Following her initial evaluation, Dr. Conrad prescribed anti-inflammatory medications. While Shirkon responded transiently to the anti inflammatory medications Dr. Conrad had prescribed, his condition continued to deteriorate necessitating more information to guide his ongoing therapy. Because of Shirkon’s shear size a traditional neurologic examination that relies on reflex hammers, bending joints and tapping tendons, would be challenging. The limited physical interaction possible with essentially wilds animals like Shirkon that just happen to have 3 inch long canine teeth and a bite force able to crush the largest human thigh bone would make a difficult physical evaluation impossible. As a result it was not known if Shirkon’s symptoms originated from a problem in his brain or a problem in the spinal cord in his neck. 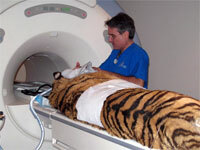 As a result, Shirkon was potentially in need of two different MRI procedures. The first would evaluate his brain and middle ears. If that evaluation was negative for disease, a second MRI of the spinal cord in his neck would be needed. Managing the general anesthesia necessary to perform a diagnostic imaging procedure like an MRI is nothing unusual for Dr. Conrad, she routinely cares for patients that range in size from Shirkon’s massive weight to comparatively minute, pocket pets like mice. But Dr. Conrad needed a facility that could accommodate both Shirkon’s massive size as well as her need to limit his anesthesia time, despite the logistical hurdles that such a massive patient creates. Dr. Conrad knew that many veterinary imaging facilities utilize miniaturized equipment either made to image small human body parts like knees and ankles. Alternatively other veterinary imaging facilities use more full sized equipment that is housed in cramped mobil trailers parked in the parking lot next to the veterinary facility. Shirkon’s shear size precluded the use of either of these options. Inducing anesthesia in a patient of this size requires a coordinated effort. Once the preliminary work is done, the patient is ready for the imaging to begin. 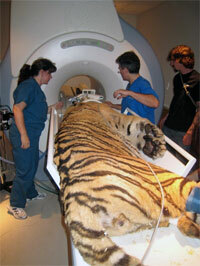 Finished with the scan, the process of moving this large cat out of the MRI suite remains a big job. Strength is not just important in the wild kingdom. At least in the realm of Magnetic Resonance Imaging, the strength of the magnet is king. As it turns out the more powerful the magnet the quicker it can obtain the images. As a result, more and more powerful magnets are constantly being developed to allow a greater human patient throughput and ease human patient anxiety associated with the MRI procedure by shortening the procedure. And while shortening the time it takes to complete an MRI procedure is important in the human market, the ability to generate images quickly is even more important with veterinary patient’s who require the use of general anesthetics to immobilize them for the procedure. The more powerful magnets have offer additional benefits as well including the ability to acquire thinner slices and image smaller anatomy. While these benefits would not be needed for a 425 pound tiger, they can be very useful when imaging the spinal cord of a 3 pound kitten or imaging the brain in a bald eagle. The diverse nature of veterinary patient size exceeds what most human diagnostic imaging centers encounter. While very few veterinary facilities have MRI units installed within the physical walls of the building, even fewer have MRI units with sufficient magnetic field strength to ensure the optimal brief imaging times Dr. Conrad needed for Shirkon. Indeed AVMI is the only diagnostic imaging facility in southern California that has a super conducting, high field, 1.5 Tesla MRI scanner dedicated for veterinary use. 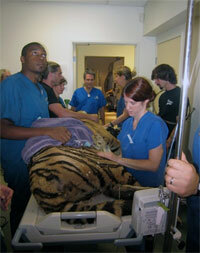 Following the procedure, Shirkon requires continued monitoring to ensure he has an uneventful recovery from anesthesia. In addition to equipment better than what is available in most human imaging facilities AVMI has the advantage of over 20 years of veterinary diagnostic imaging experience. Dr. Michael Broome began offering diagnostic nuclear medicine imaging procedures to southern California veterinary patients in 1986. Since that time, AVMI has expanded to provide additional diagnostic imaging modalities including CT and MRI. Some veterinary diagnostic imaging centers are operated by individuals with limited experience interpreting veterinary specific imaging studies. This can lead to errors in the diagnosis or missed diagnoses. The presence of veterinarians experienced in diagnostic image interpretation on-site during the actual procedure allows for real time image interpretation. This ensures appropriate, on-the-fly, adjustments in the procedure can be performed to maximize the diagnostic value of the procedure as well as minimize the general anesthetic time to obtain that information. In Shirkon’s case, it took only 10 minutes to determine that his brain was normal and not the cause of his weakness. Within less than an hour of imaging time the diagnosis of cervical intervertebral disc disease (i.e., a bulging disc in his neck) was made and Shirkon was on his way to recovery. Now all that was left is for surgery to be scheduled for another day.